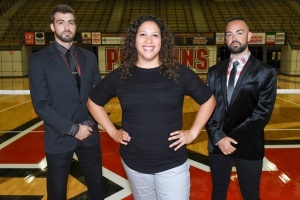 In January, the Youngstown State University volleyball team introduced its tenth head coach in the program’s history, Aline Scott. Scott comes to Youngstown from a very successful career in volleyball as both a player and coach. Prior to YSU, Scott spent five years as an assistant coach for the University of Akron to start her collegiate coaching career. Then she moved to her first head coaching position at the Indiana University of Pennsylvania. After two years at IUP, she moved on as the head coach of Hiram College’s volleyball program for three seasons before taking over at YSU. Before she went on to have success in her coaching career, Scott fell in love with the game at a very young age. Midway through her senior year of high school in Brazil, Scott joined an exchange program that sent her to Brookfield, Conn. As of 2016 Brookfield’s population was just over 17,000 people. Despite such a culture change at only 18 years old, Scott went on to play college volleyball at Marist College in Poughkeepsie, New York, which had a lasting effect. “After being in college here, I knew I wanted to stay,” Scott said. Though she wanted to live here, Scott didn’t know if volleyball would continue to be a part of her life after college was over. A conversation with her mother made Scott realize volleyball was destined to be with her forever. With that, Scott took her first coaching position after college at Staples High School in Connecticut. Under Scott, the girls’ volleyball team finished fourth in the state and the boys’ volleyball team won the state title. After coaching at Staples High School, Scott went on to be a graduate assistant coach at Central Michigan University for two years before starting her tenure with the Akron Zips. Scott, now 35 years old, found out about an opening at YSU from former coach Mark Hardaway, whom she’d been close with. Living in the Youngstown area for a few years, Scott was familiar with YSU. Being a part of the YSU volleyball program is something Aline Scott isn’t taking for granted especially with the resources for her new team. Resources aren’t the only reason Scott is excited to be at YSU. While at Hiram, Scott was commuting an hour each way everyday from her home in Poland. Now being only 15 minutes away, she’s spending more time than ever with her family. “On an everyday basis I’m closer, so it makes life a little bit easier,” Scott said. She has a 3-year-old son named Matheus, and is excited that he can be more involved in her work life too. With family by her side, Scott now shifts her focus to the season, which is currently underway. 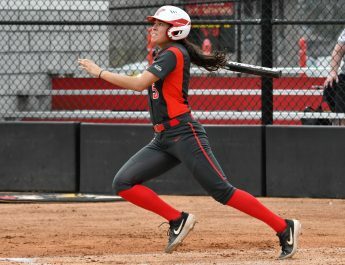 Her players, even the newcomers, have responded well to the culture change, and she hopes it will continue throughout the season. “I think they’re doing really well, as expected from freshman, they’re just surviving and trying to figure out where they belong,” said Scott. Her players also feel the change that has come with Scott running the show. “The overall feel is unity. We’re not playing for ourselves, we’re all playing for each other,” Morgan Tippie, a fifth-year senior middle blocker, said. A career that started with as a 9-year-old playing volleyball in Brazil has come full circle in downtown Youngstown. “I’ve gone from playing to assisting at every level. I’ve kind of seen it all, that’s how I feel. Hopefully we’ll make this program a success.” Scott said. She is well on her way in accomplishing just that, as the Penguins have started the 2018 season with a 3-1 record. The next match for the Penguins is scheduled for Friday, Aug. 31 against the University of Nevada-Las Vegas at the Duquesne Invitational held in Pittsburgh, Pennsylvania.